LAD Brokerage offers a variety of coverage in different lanes across the U.S. We treat carriers like customers and value their commitment to LAD Brokerage. Our technology is unrivaled as we offer carriers the ability the log in and view available loads post equipment and track payment status. We have our own trucks so we understand the costs associated with operating. This is why we offer a competitive quick pay program with direct deposit, contact one of our associates to see which program works best for you. 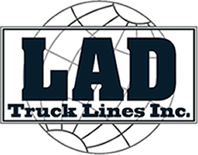 LAD Truck Lines / Logistics is offering 2 different methods of quick pay. Remember, in order to enroll in the quick pay program you need to be signed up for direct deposit. Bills can be submitted via fax / email or even TransFlo. Below are details about the TranFlo option. Total control of you documents because you get to keep the original paperwork. Ability to confirm that your invoices arrived for processing with the confirmation number provided. Eliminates the need to make Copies before sending your documents saving you time and money. GO to your smartphone store or www.transflovelocity.com to get the free application, to get started today. Use our Broker ID of LADNV.